© 2017, Fannie Mae. All rights reserved. Fannie Mae and the Fannie Mae logo are registered marks of Fannie Mae. Fannie Mae is an equal opportunity employer. Want to use your talents at a company that values diverse backgrounds and perspectives? Visit fanniemae.com/careers to see our openings and apply online. 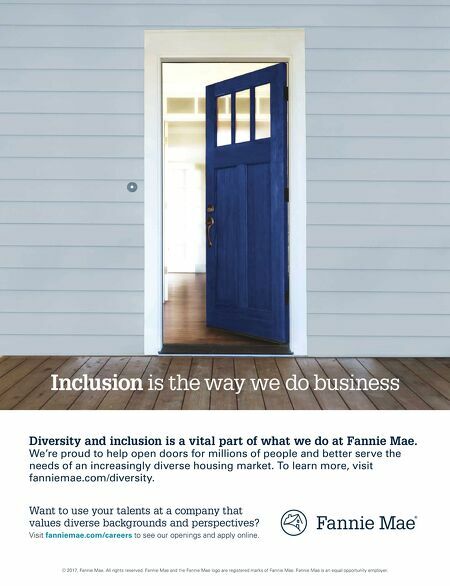 Diversity and inclusion is a vital part of what we do at Fannie Mae. We're proud to help open doors for millions of people and better serve the needs of an increasingly diverse housing market. To learn more, visit fanniemae.com/diversity.